The Pagoda is situated inside the city and first built during the Five Dynasties period (907-960), was originally called the Baozhuangyan Pagoda but during the Northern Song Dynasty, a writer called Su Shi wrote the inscription Liu Rong (Six Banyan Trees) because of the six banyan trees he saw there and it has since been called the Pagoda of the Six Banyan Trees. Now there are only two. There is a Buddha in each opening of the pagoda, which is supposed to have been built without the use of nails. The pagoda enshrines three large Buddhist statues--the biggest copper Buddhist statues existing in Guangdong province. The thousand-Buddha copper pillar cast in the Yuan Dynasty (1271-1368) is kept on the top story of the pagoda. The 184-foot pagoda appears to have nine stories; inside, however, there are 17 levels. 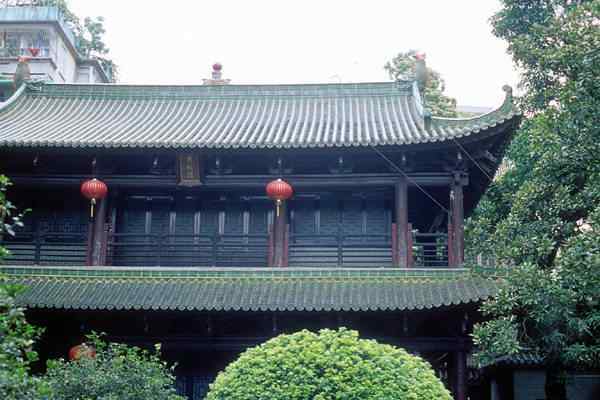 Because of the colorful exterior carvings, it is popularly known as the Flower Pagoda .